As stated in my Chungking Express post, Fallen Angels is the follow up to Chungking Express that is essentially what would have been part 3 of that film. Having taken a break during the making of Ashes of Time, WKW decided to quickly shoot a film to release in order to gain a cashflow for his new company, he wrote parts of three different storylines. The first two make up Chungking Express. After those ended up long enough to make their own film, he separated the third story into it's own film. The film is about the mystery of solitude, and lives spent in the city and yet somehow still on the outskirts of society. These night owls live their bizarre and dangerous lives in their routines and the spontaneity of non routines. It’s perhaps WKW’s most “fun” film. It's in a way very non WKW, and yet so WKW it’s borderline self parody. In fact, while there are many parallels to Chungking Express, instead of thinking of this film as a sequel you should think of it more like a self parody. It’s the other side of the coin. It's the opposite of Chungking Express. Kaneshiro Takeshi is the perfect example. He doesn't play the same character as much as he plays the opposite of that character. From cop to criminal; from someone who can speak, to someone who can't, from someone with a job to someone without one. The film features his most outlandish cast of loners, Kaneshiro Takeshi being just one of them. Each new character we meet is even crazier than the last. This is perhaps Wong Kar Wai’s only movie that is truly going for comedy. 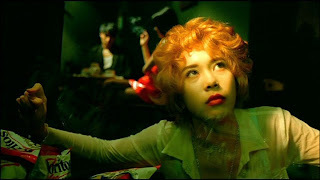 While everyone tends to refer to this as part 3 of Chungking Express, I think of it as parts 3 and 4, because unlike Chungking Express that features two separate storylines cut into two distinct parts, Fallen Angels is two separate storylines that are intercut together throughout the film, and it ends with a character from one part running into a character from the second. Much like the concept of counterpoint music, the second storyline is a counterpoint to the first. The first a more serious story about an assassin and his partner, the second a comedy involving a mute character whose only source of income is to break into businesses around the city and force passersby to “enjoy” his products and services, which typically involves him annoying the customer into paying their debt for his work. Wong-Chi Ming, the assassin (Leon Lai), meets up with his partner, known only as The Killer’s Agent, because of WKW’s tendency to either not name his characters at all, or just give them titles that refer to either their job or their disposition in life. She’s played by Michelle Reis (once voted Miss Hong Kong), who is the brains of her own seedy little outfit, that for all we know involves only herself and Ming. They rarely see each other, but that is supposedly the best way to work a relationship such as this. He considers himself a lazy person and prefers to have her do all decision making and planning. She cases the location of her hits, and faxes over the plans to Ming. There is even a scene or two in which we see her casing the location and watching the marks while Ming, in parallel editing, is seen going in for the kill. She also provides him an apartment and stops by to clean while he’s away. She is clearly in love with him. She steals his trash and goes through it to find out more about him, and she frequents the bar he usually goes to, although only while he’s away. She sits at his usual spot and daydreams about him. It allows her to feel close to him. WKW is very good at humanizing his main characters through spending random days/moments of everyday life with them. We see the assassin get on a bus where he runs into an old classmate from his childhood. In this moment he reminds us that everyone, even assassins, have a past. Even they will run into old classmates from time to time. Eventually he meets a crazy blonde woman, known as Blondie (Karen Mok), at McDonald's. She is clearly in an unstable emotional state. She was in love once and has clearly never recovered. She even begins to think that maybe Ming is her lost lover. It provides an interesting insight into perhaps, why she is the way she is, and why she continually goes from one man to another. Another one of WKW’s fascinations, and frequent themes is the ways in which different people cope with lost love and loneliness. These clearly have different effects on everyone, and WKW’s filmography is full of different examples. In Chungking Express we saw two cops dealing with lost love in their own ways, and here in Fallen Angels we see three female characters dealing with lost or unrequited love in their own ways. In the case of Blondie, lost love has had a deep psychological effect on her. She is similar to Brigitte Lin’s character with a split personality from Ashes of Time that seems to be desperate to recapture that lost love to the point where they mistake new people in their lives for the person that left them. Or perhaps they merely project that lost love onto a new person, which explains why Blondie goes from one man to another always trying to find that love again (very, very similar territory to that found in WKW’s 2004 film 2046). The way the agent deals with her loneliness and unrequited love for Ming is essentially to stalk him or frequent places he likes to go in order to feel close to him. However, Ming is tired of stitching himself up after every firefight. He is ready to make a change. The first decision he makes in the partnership is to leave it. However, out of jealousy (having figured out that he had been seeing Blondie) and anger at losing the partnership, she sets him up. She sends him on one last hit where the targets know he’s coming. The Agent happens to live in Chungking Mansions (that I talked about quite a bit in my post on Chungking Express) where the main character from the second storyline lives. She hides him in her closet so the authorities won’t find him. 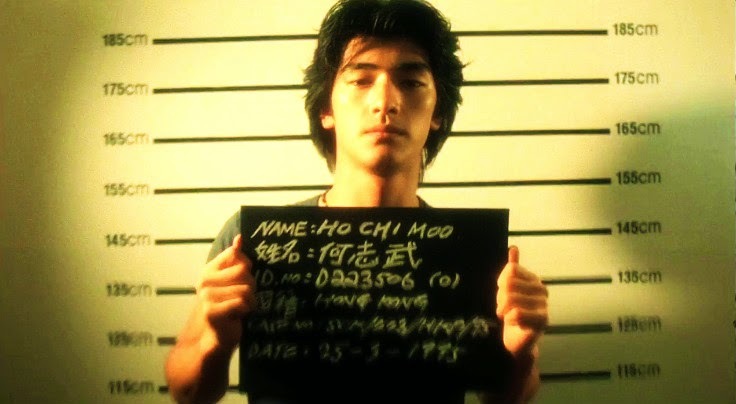 He is Ho Chi Moo or prisoner #223, played by Kaneshiro Takeshi who is essentially playing the opposite of his character Cop 223 or Qiwu/He Zhiwu from Chungking Express. The interesting part, and indeed the difficulty, for Kaneshiro Takeshi as an actor here is that he’s playing a mute. He has to portray his emotions and desires entirely without words. #223 (I’ll just refer to him as #223 for the rest of this) is easily WKW’s most comical character. 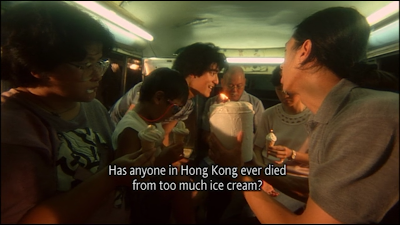 In another parallel to Chungking Express, he ate a can of expired pineapple at the age of 5 that made him sick and stopped talking ever since. Being mute makes it hard to make friends and find work, so the only way he can make money is to break into other people's shops after hours and force people to pay for his work whether they wanted it or not. The scenes in which he explains his background, why he doesn't speak, and why he's chosen to “work” the way he does is comically intercut with different attempts to force people to pay for his “services.” The funniest of these is when he continually runs into the long haired man and his failed attempts to get away from #223. We also meet #223’s father, who is a manager at Chungking Mansions where they live. He just so happens to be played by none other than the actual manager of Chungking Mansions. For a non actor he also gives a strong performance, even being nominated for an award for best newcomer. One of the best things about the film, is these scenes involving the father. I like the relationship established between the two. It's charming when #223 tries to make a home video for his father's birthday, and sad when the father passes away. But watching their story is one of the nice little sub plots packed into the film. Eventually he runs into Charlie (Charlie Yeung), the third girl who is dealing with lost love. Her boyfriend left her for someone only known as Blondie (we assume it’s Karen Mok’s character). The humorous bit here is that instead of being able to force his services on her, she forces him into being her shoulder to cry on. #223 has met his match in this character. They have something of a romance, although their scenes together are mostly spent trying to find Blondie so she can get her revenge on her. Charlie is the obsessively jealous type, and most of her scenes involve her being angry at some unknown person named Blondie. It echoes WKW's ever present theme of longing and lost love. She eventually moves on and finds a new boyfriend, leaving #223 a little heartbroken. She runs into him again at the Midnight Express (one of the primary locations in Chungking Express) where he has taken over for the night. He dances around while working there parodying Faye Wong’s character, and Charlie shows up in a flight attendant uniform to wait for her boyfriend to show up. Obviously this scene alone is one of the biggest parallels to Chungking Express. Charlie, having found herself a new and healthy relationship, seems to have completely forgotten about #223, to the point that she doesn't even recognize him. At the end of the film #223, and the agent cross paths again, and the film ends with them riding off into the night together. It's left ambiguous, but it seems as though these two might form some sort of partnership. In fact, it's obvious from the deleted scenes that WKW originally intended to show them working together as partners. However, having cut these scenes, their new-found relationship is one of having found someone in a time of loneliness and need. They've met each other a few times before (she hid him in her closet so he could hide from the cops earlier in the film), and #223 initially thinks they've had too many chances to "rub elbows" in the past and yet nothing has happened. But now that they are both reeling from lost love, they enjoy at least one evening together. The final scene in which these two crazy characters meet up, ride on his motorcycle through the winding underground tunnel; we see a puff of smoke as they exit the tunnel and then the film slows down as the camera pans up to see the city above, all to the tune of The Flying Pickets acappella version of Only You is one of the finest endings ever put on film. It's pitch perfect after the journey we've just been on. WKW has a knack for putting together great soundtracks, and The Flying Pickets version of Only You has been a favorite ever since the first time I saw this film. Upon viewing the film after seeing Chungking Express it's evident that these two are tied in some way due to the fact that it carries similar themes, shooting locations and styles of shooting/editing. In fact, toward the beginning of the film, the assassin (Leon Lai) is seen going to the same set of lockers where Brigitte Lin’s character gets the pistol she uses to gun down the drug lord in Chungking Express. Also, all the aforementioned parallels with Kaneshiro Takeshi’s character, including the scene in which he takes over the Midnight Express for the night. He also lives in Chungking Mansions, meaning he spends time in both of the primary shooting locations for Chungking Express. Also, much like in Chungking Express there are theme songs that accompany the different parts of the film. The assassin doing his work is accompanied by the song "Because I'm Cool" by Nogabe "Robinson" Randriaharimalala. It's slow beats fits the slow motion action of these killings. When the assassin wants to send a message to his agent that he's quitting, he leaves a note for her at the bar to listen to the song "Forget him," by Shirley Kwan. The film also features a song roughly translated as Yearning People by Chiyi Chin (齊秦 -思慕的人) that plays while #223 makes a video for his father's birthday (which has also become a favorite of mine since seeing the film). Soundtrack Playlist available here. As far as the look of the film goes, in my previous post, I mentioned how WKW has a background in graphic design, and likes to try different things visually. They say there is nothing more interesting visually than the contours of the human face, and here we get a lot of extreme, intimate closeups, where the cinematographer was literally a foot away from the faces of the actors with a wide angle lens that create almost a distorted fisheye look, representative of the distorted lives these characters live. WKW once said of the choice that a person face curves like a banana when shot in extreme close up with a wide angel lens. Both WKW and cinematographer Chris Doyle (who worked on Chungking Express as well) like bold choices and experimentation within the medium. That’s an approach I can respect, and it gives the film a unique look separating it from even Chungking Express. It’s amazing to me how the film techniques look the same across both of the stories in this film, and yet the mood is so drastically different from one to the other. 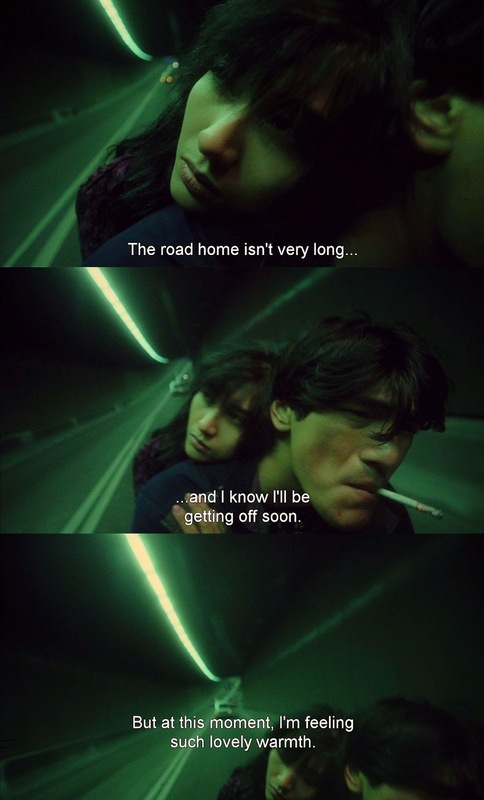 Certainly there are scenes in which WKW employs fast cutting, but there are just as many scenes in which he allows the camera to linger on characters faces, or objects in the frame, such as the pig #223 massages, the colorful jukebox the agent plays music from, or a puff of smoke as they ride away into the night. The extreme closeups are consistent throughout the film, and the colors are both beautiful and yet over-saturated with a greenish tone. The first storyline is obviously more serious, and the second is much more fun loving and spontaneous. Yet they feel perfectly at ease with one another because of the consistent visual approach to the entire film. Of course, the same can be said for Chungking Express, and the consistency there is even more incredible considering that the cinematography for the first part was done by a different person then the person who did the cinematography for the second. Fallen Angels and Chungking Express represent the spontaneous and fun loving and even experimental side of Wong Kar Wai while still carrying the themes of lost or unrequited love he's known for. In his filmography every other film is made with a more serious tone, a more careful and planned shooting, editing and writing. While I love his films serious or not, it’s these more light-hearted, spontaneous and humorous films that I find the most enjoyable. I have no idea what WKW may have in store for us with his latest film project, but I do hope that it's a return to this style of film. Some of the humor may be lost on western audiences. It's my understanding that WKW uses slang very well, and to humorous effect, which can obviously be lost in translation. However the film's characters and situations are humorous enough on their own to be entertaining to any audience. While it may not grab people immediately the way Chungking Express does (easily one of his most accessible films), this film is a strong entry in WKW's filmography, a personal favorite, and one that gets better with repeat viewings.